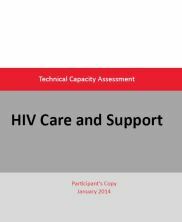 The purpose of this tool is to help an organization assess its ability to implement effective HIV activities by looking at its overall approach. This tool looks holistically at personnel, documents, and systems in place at the organizational and implementing partner levels (if applicable). This TCA tool is designed to provide organizations with a set of criteria to assess their current technical capacity to develop and implement quality health promotion activities, to identify key areas that need strengthening, and highlight components that can serve as a model for other HIV activities and programs. JSI, 2014. This version is a Participant’s copy, for the Facilitator’s copy, including detailed discussion questions, please e-mail capacitydevelopment@jsi.com. Full list of technical capacity assessment tools.